Gudauri is a ski resort located on the south-facing plateau of The Greater Caucasus Mountain Range in Georgia. The resort is situated in the Stepantsminda District, along the Georgian Military Highway near the Cross Pass, at an elevation of 2,200 meters (7,200 ft.) above sea level with skiable area enjoying maximum exposure to the sun. The resort offers high quality skiing opportunities.The ski season lasts from December to April. Gudauri is the best ski resort in Georgia with well-developed infrastructure, the greatest difference in altitude, and unlimited possibilities for freeride, back country (ski touring).Ski rentals are located in several places: in the village of Lower Gudauri, and in the Upper Gudauri, near the gondola station. Freeride is possible both along the trails near the ski lifts and in the neighboring area along the western and eastern slopes of the mountains Chrdili, Bidara and the northern slopes of Mt. Sadzele (Kobi Gorge). 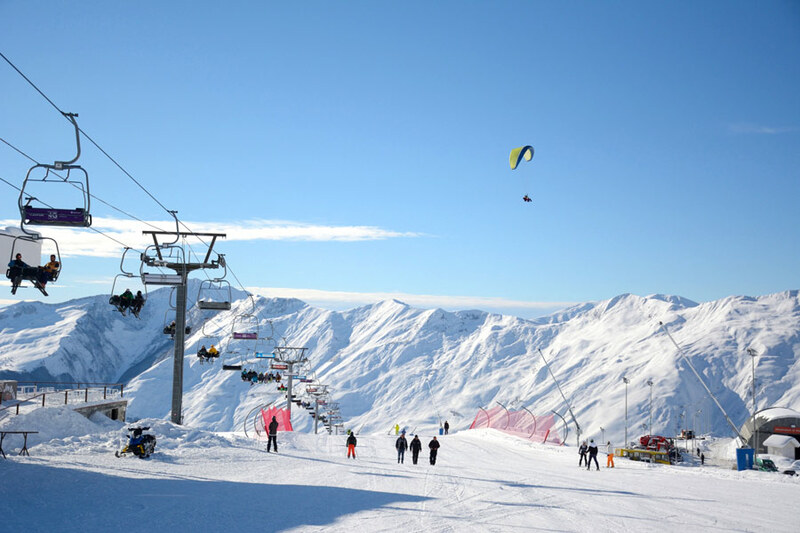 Adrenaline seekers also have the chance to try paragliding, speedriding (an extreme mix of skiing and paragliding) and heli-skiing.